A pensioner was left fighting for his life after being mowed down by a getaway car being chased by police following a robbery. 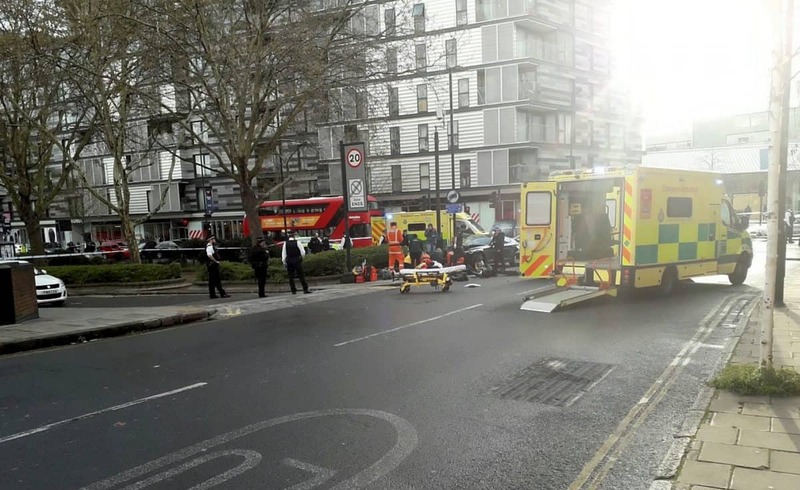 The elderly pedestrian is said to have suffered “life threatening” injuries in the horror smash near Kings Cross station in north London during Tuesday evening’s rush hour. Police were called at 5.30pm last night to Caledonian Road near Kings Cross in north London to respond to a robbery. The getaway car refused to stop for police and a high-speed chase followed befgore the vehicle ploughed into the man on York Way. Four men then got out the vehicle and fled the scene. Police say three men were arrested nearby on suspicion of robbery and taking and driving away the car. They remain in custody. The Directorate of Professional Standards has been informed and the incident has been referred to the Independent Office for Police Conduct. A Scotland Yard spokesman said: “Officers responding to a robbery requested a vehicle suspected to be involved to stop. “The driver refused to do so and drove off at speed, colliding with a member of the public. “Four men are believed to have decamped from the vehicle and fled the scene. “Three men were arrested nearby on suspicion of robbery and taking and driving away and they were taken into custody where they remain.